I think it's high time someone published the rules for using elevator buttons, especially the ones outside (that call for an elevator). I am sick and tired of the way these buttons are misused. The two buttons available to call an elevator have an up arrow and a down arrow. These are meant to indicate whether you want to go up or down, not whether the elevator must come up or down. For example, if you're on Floor 3 and you want to go to Floor 7, you need to press the Up arrow button. Many people see that the elevator is on Floor 5 and press the Down arrow button. When I ask them why they pressed the Down arrow button when they wanted to go up, they say I want the elevator to come down. Well, the elevator will figure out where it has to go but you please just let it know where you want to go because the elevator has no way to figure that out. Never press both Up and Down arrows. It does not cause the elevator to come to your floor quicker. It simply causes more delays later in the process! Let us say the elevator is on Level 7. You are on Level 0. You want to go to Level 5. The Up arrow is already pressed. You come and press both the Up and Down buttons. The elevator was planning to go to Floor -2. Since you pressed the Down button, it will stop at Level 0. No one will get in or out. But you will have to wait until the door opens, waits a few seconds and then closes. You could have saved all that time! 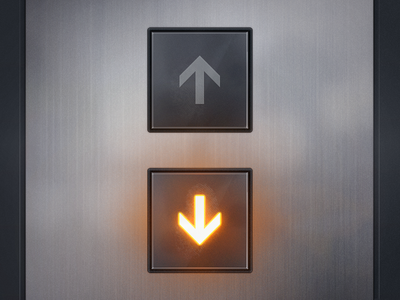 If one of the arrows (Up or Down) is already lit up, pressing it again 2-3 times in quick succession does not make the elevator come to your floor quicker. I see people who are in a rush. They will come to the elevator, see that one of the buttons is already pressed. But they're apparently in a hurry and so they will press the button again muttering some profanities under their breath. No, it does not help! There you go! Two simple rules to ride elevators efficiently and make this world a much better place!